If you're considering a wedding in the Hamptons, you'll definitely want to check out the top Hamptons wedding venues to start planning your big day out east. 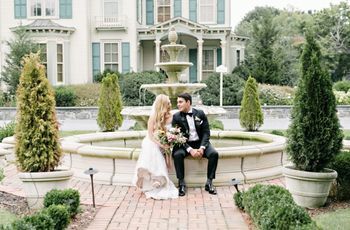 The East End of Long Island isn’t just a vacation hotspot for well-heeled New Yorkers, it’s also a romantic setting for weddings of all styles. There are lots of incredible Hamptons wedding venues to choose from, whether you’re looking for a charming inn, a grand vineyard, a gorgeous garden, a casual beach, or a luxe club. And if you’re hosting a destination wedding, your guests are certainly in luck due to the wide variety of activities, must-see attractions, and gorgeous scenery in the area. If you’re considering a wedding “out east,” then check out these Hamptons wedding venues to start planning. Located in Amagansett, this Hamptons wedding venue is ideal for couples looking for a rustic garden setting for their dream wedding. 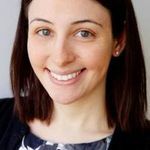 Your guests can stay on premises for the whole weekend, and you can host a variety of wedding-related events here, as well, from a clam bake (or pizza, or BBQ) rehearsal dinner to a post-wedding brunch. On your big day, host your ceremony outdoors with a tented reception following on the great lawn. 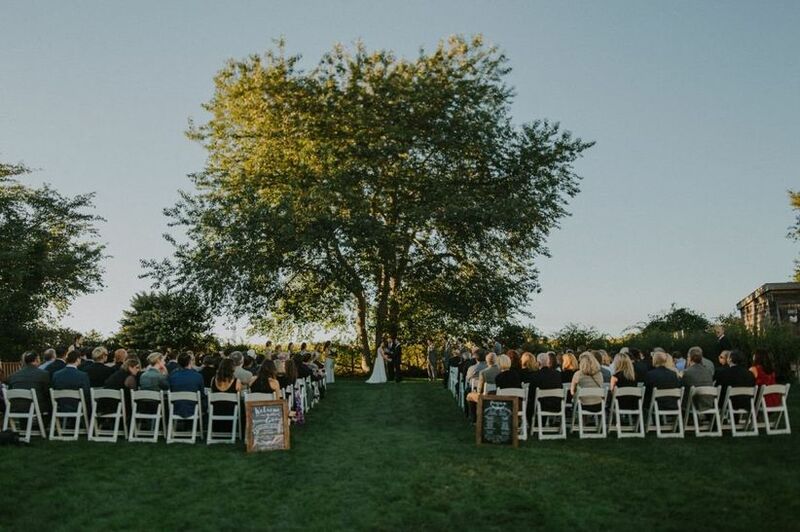 There’s room for 250 guests for weddings, and this Couples’ Choice Award-winning venue wins raves for the accommodating staff and gorgeous, peaceful setting. This recently renovated 14-room historic boutique hotel is a lovely spot for a more intimate wedding, rehearsal dinner, or other event for up to 120 guests. There are several event spaces, including the airy Conservatory, the cozy Library, the classic Founders Room, and the Dining Room. The on-site chef can create your dream wedding menu, and your guests will appreciate the Quogue’s location just 90 minutes from Manhattan. 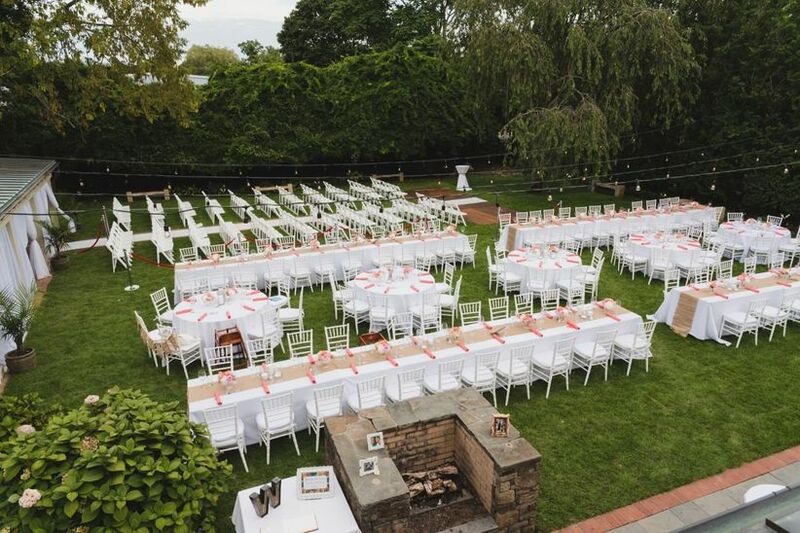 Looking for a Hamptons wedding venue with indoor and outdoor space? This restaurant venue in Southampton is a popular spot. 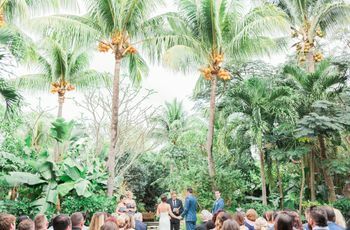 You can rent out the entire restaurant and host your ceremony on the 3,000 square foot lawn, followed by a reception indoors or outside in the cabana area. Work with the Southampton Social Club’s highly-regarded executive chef to design your ideal menu. 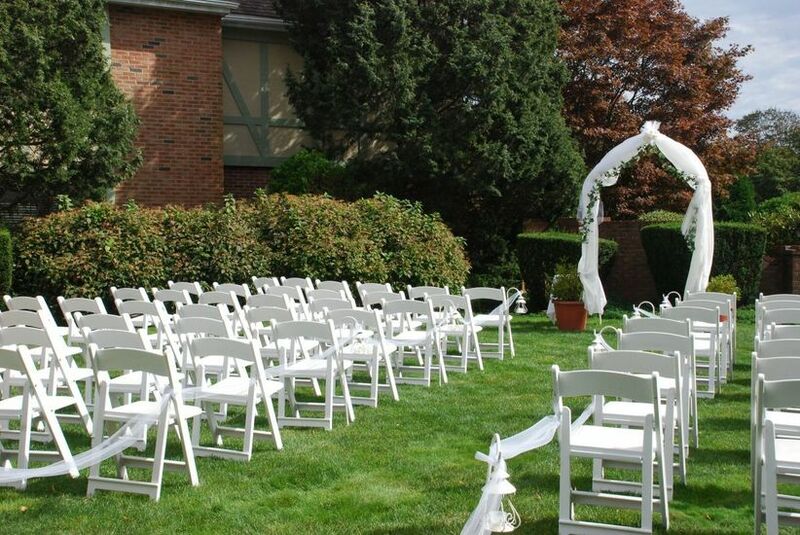 While this is an ideal venue for smaller events, it can host weddings of up to 1,000 guests. This tennis and beach club is the quintessential Hamptons wedding venue. You’ll love the space’s nautical feel, plus the 1,200 square feet of private beach where you can exchange vows—it’s one of the few venues in the Hamptons that allows ceremonies directly on the sand. 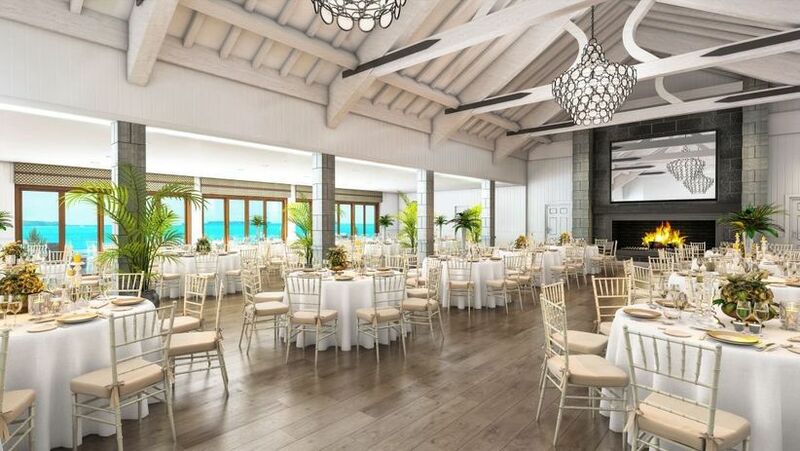 Enjoy cocktail hour on the oceanfront decks, and then a reception in the ballroom, which features hardwood floors, white walls, and floor-to-ceiling glass doors to enjoy the scenic views. Plus, you can host a beach bonfire as your after-party! There’s an exclusive on-site caterer to make your planning process extra-convenient, and space for up to 240 guests. 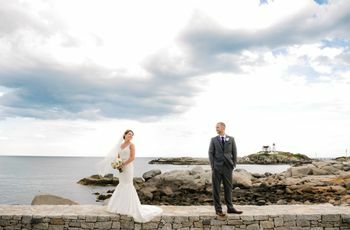 Looking for a space that combines the beauty of the beach (hello, amazing photo ops!) with a glamorous vibe? 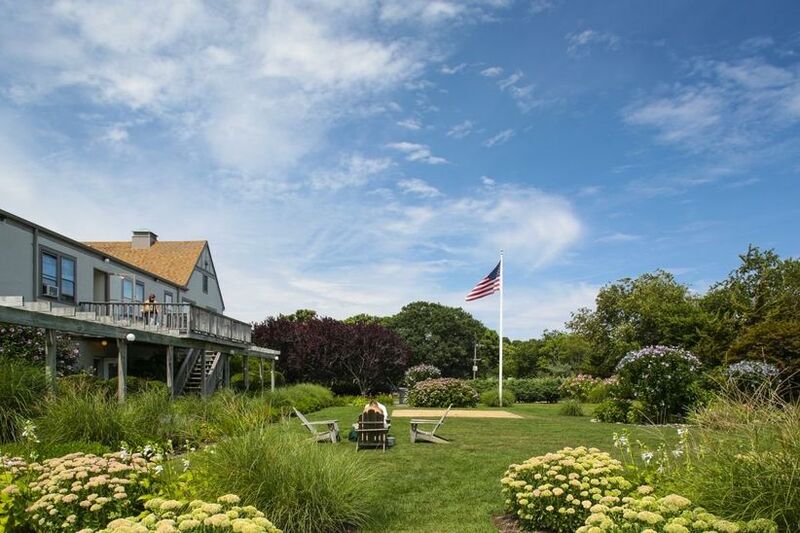 Check out this Hamptons wedding venue, known for its gorgeous views of the Atlantic Ocean. Say “I do” directly on the beach or in the semi-permanent tent on the expansive property. Then, enjoy dining and dancing in the majestic ballroom, complete with high ceilings, a sparkling chandelier, and 20-foot windows. Your guests can stay in the on-site guest rooms for added convenience. Couples rave about the incredible service and delicious on-site catering. This venue can host weddings of up to 220 guests. 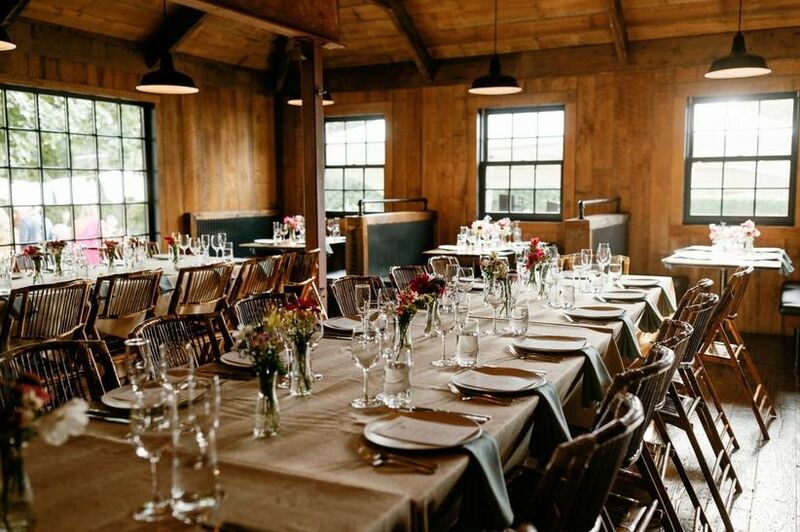 If a boho-chic wedding is totally your vibe, then be sure to check out this caterer-owned venue in Bridgehampton. You’ll love the farmhouse feel as well as the outdoor garden, decorated with twinkle lights and papel picado garlands, at Salt Drift Farm, plus the farm-to-table food is out of this world. And with no venue fee (just a food and drink minimum), it’s actually one of the more affordable Hampton wedding venues. There’s space for up to 125 for a seated dinner and 150 for a cocktail-style reception. 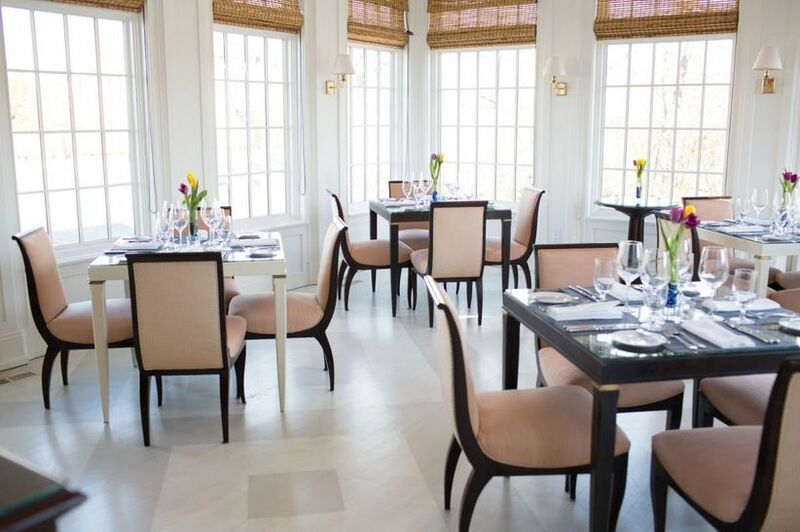 This Mediterranean restaurant is an ideal Hamptons wedding venue for foodie couples. There are several spaces to choose from, including a private dining room, a covered outdoor terrace, and an open-air lounge. You can also rent out the entire restaurant, which includes a lawn area and can accommodate up to 175 guests for a seated dinner. This is also an ideal spot for rehearsal dinners, and the family-style cuisine is highly regarded. A historic inn and restaurant located in Bridgehampton, Topping Rose House has so much to offer as a luxe wedding venue. Of course, there’s the delicious food, but also the variety of spaces where you can host a totally romantic wedding day. 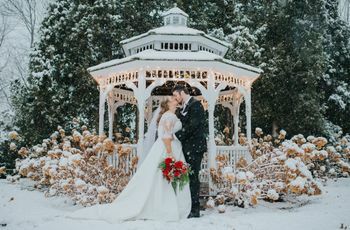 Exchange vows with the historic mansion as your backdrop, and then enjoy a reception in the rustic barn, the airy restaurant, or the spacious studio. There’s room for up to 200 guests, and nearest and dearest can stay in one of the 22 impeccably-appointed guest rooms on premises. Hoping to host a nautical-chic wedding? 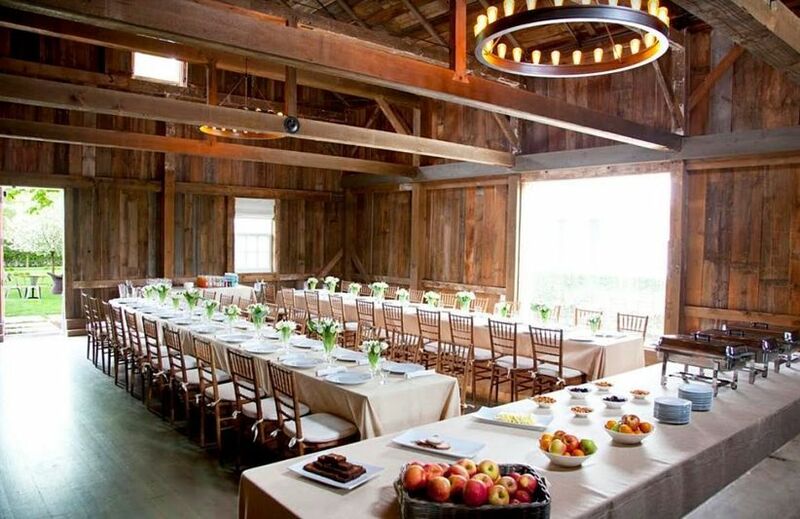 This Hamptons wedding venue is the place! 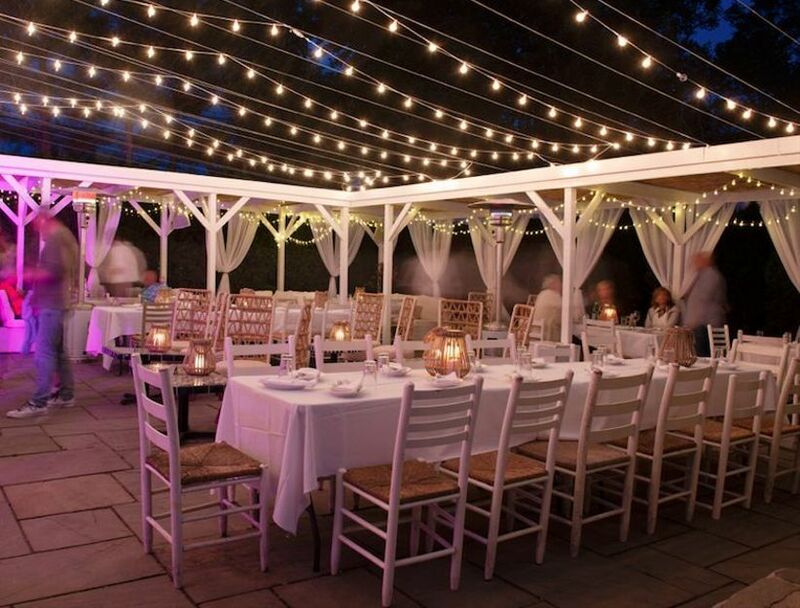 The Inn Spot on the Bay, located in Hampton Bays, has a scenic waterfront setting on Shinnecock Bay and lots of outdoor space for tented weddings of up to 300 people. This Hampton wedding venue is caterer-owned, and the executive chef will work with you to create an event menu to suit your taste. The inn also has 13 guest rooms so your wedding party can stay on site for the ultimate destination wedding weekend on the water. This is one of the few banquet halls in the Hamptons—and it’s truly a grand, majestic space. 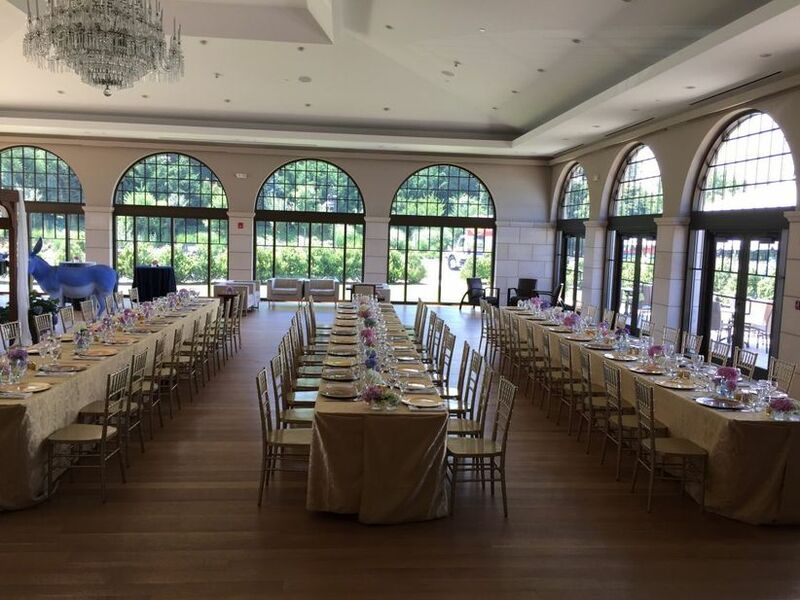 This Southampton ballroom features gorgeous arched windows looking out onto well-manicured gardens, which are available for outdoor or tented events, as well. The venue is open year-round for events and has space for up to 250 guests. There are also on-site bride’s and groom’s rooms for getting ready, as well as a dedicated room for children, if you’re hosting young guests. 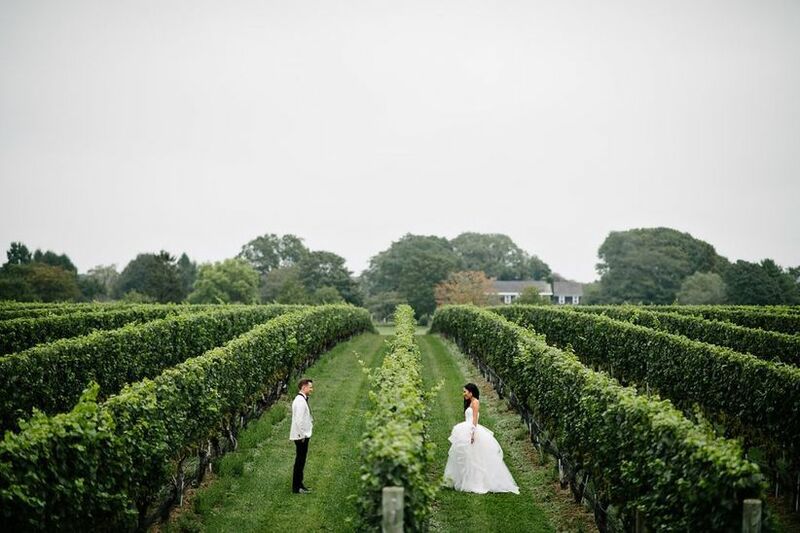 The East End of Long Island is known for its vineyards, and they certainly make for gorgeous wedding venues. Wolffer Estate Vineyard is one of the most in-demand vineyards in the Hamptons, and it’s easy to see why. The Sagaponack vineyard offers 55 acres of stunning property (plus some pretty spectacular photo backdrops), and indoor and outdoor spaces for your big day. There’s room for up to 175 guests, and a variety of wedding packages to choose from. 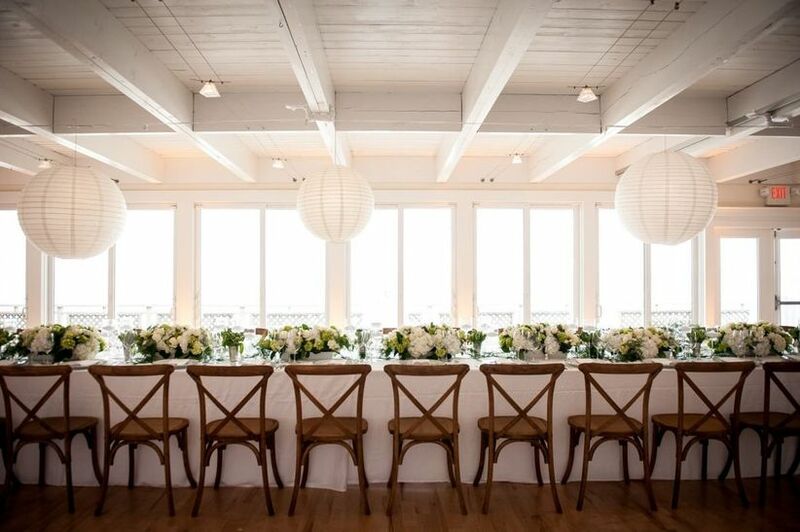 There are lots of Montauk wedding venues, but this one truly exemplifies the relaxed beach-chic vibe of the area. 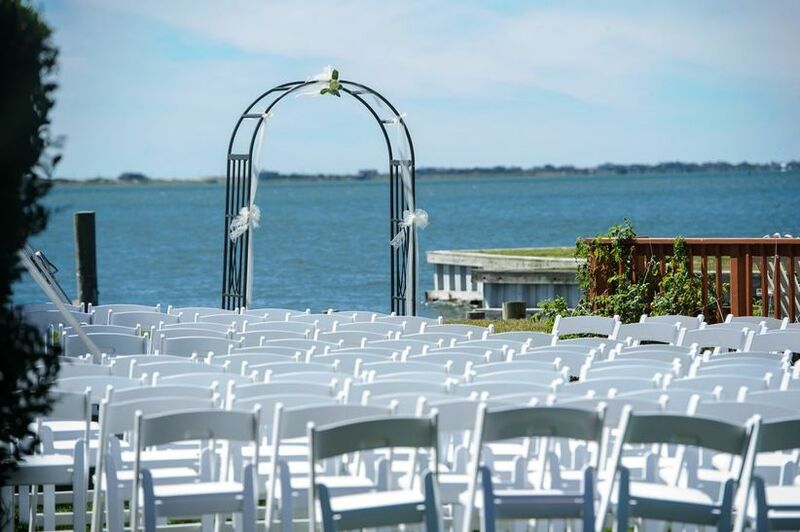 Host your ceremony on the beach, a waterfront patio, or the great lawn. Receptions are hosted in a tent or the modern Ravello Ballroom. Events both big and small can be hosted here—the capacity goes up to 1,000 guests, and there are ample accommodations for your loved ones. And—bonus!—you can also host your bridal shower, rehearsal dinner, and post-wedding brunch here, as well. 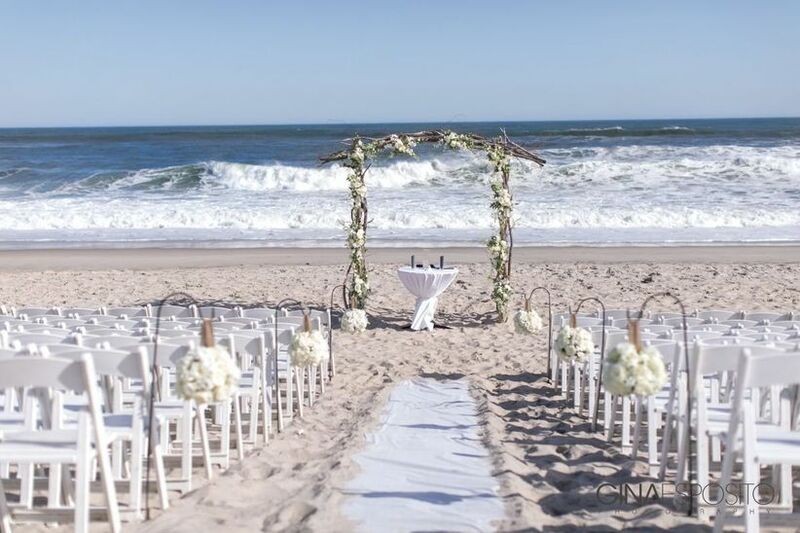 An ideal venue for a Montauk destination wedding, this resort has ample charm for an outdoor ceremony and reception. Host an outdoor ceremony, followed by a tented reception on the impeccably-manicured grounds. In-house catering will make your planning process a breeze, and your guests will love staying on premises, just a short walk away from the appealing beach village of Montauk.